Technically, there’s no winner yet for this year’s American Idol Season 12 but with the way the show is developing, this season’s winner is definitely going to be one of the remaining female contestants. It is noteworthy to mention that the first three contestants to be eliminated are male, namely, Curtis Finch Jr., Paul Jolley, and just this week, Devin Velez who sang his now signature English/Spanish singing “It’s Impossible” but wasn’t saved by the judges. This week, the bottom three contestants were the three remaining male contenders. This makes all 5 female contestants still going strong. So the question now would be who wins the competition? In an earlier post, I agreed with most advanced forecasts saying Angie Miller will win American Idol Season 12. But with her performance this week, I may have to turn my gaze over other highly regarded female competitors Kree Harrison and Candice Glover. But going back to Angie Miller, she has the whole package needed to be a star. Both other top contenders Kree and Candice similarly sings exceptionally in their own genre but with an audience which also takes note of looks and not just merely listens to a singer’s singing talents, Angie is to beat. AI’s contestants are down to 7 and we’re just a few more weeks away from seeing who wins the show. 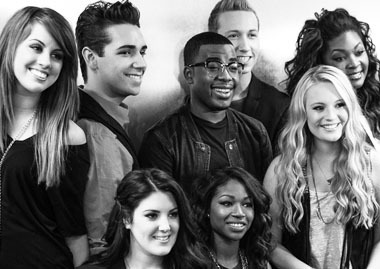 For more information on American Idol Season 12 including videos, photos, and news updates, visit the AI official website www.americanidol.com.